I will cut to the chase and tell you I am linen obsessed. Growing up I always was made to believe that linen was a fabric you steered clear of for so many reasons: hard to clean, it wrinkles easily, the fibers break when not cared for, etc. It always sounded like this high-maintenance fabric I should keep as far away from as possible. 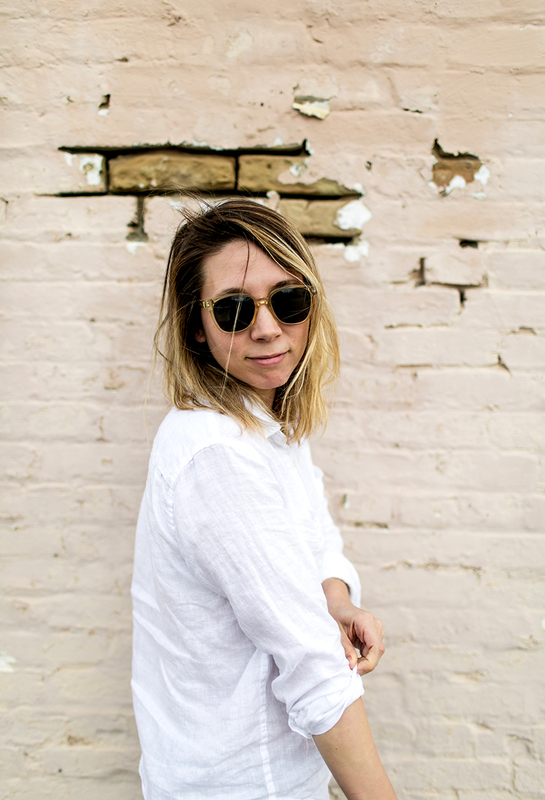 Fast forward to my late 20’s and I felt like I had a linen awakening. Maybe it was the fact I realized all the cons I was told about it were things I wanted to embrace. I realized I love the wrinkles. I love the imperfections because I love how linen feels any time of year. Thus, here I am owning linen bedding, linen table cloths, linen napkins, and a number of linen shirts and pants. This means that when spring comes around, you can bet I am eagerly waiting to pull out the linen as soon as possible. 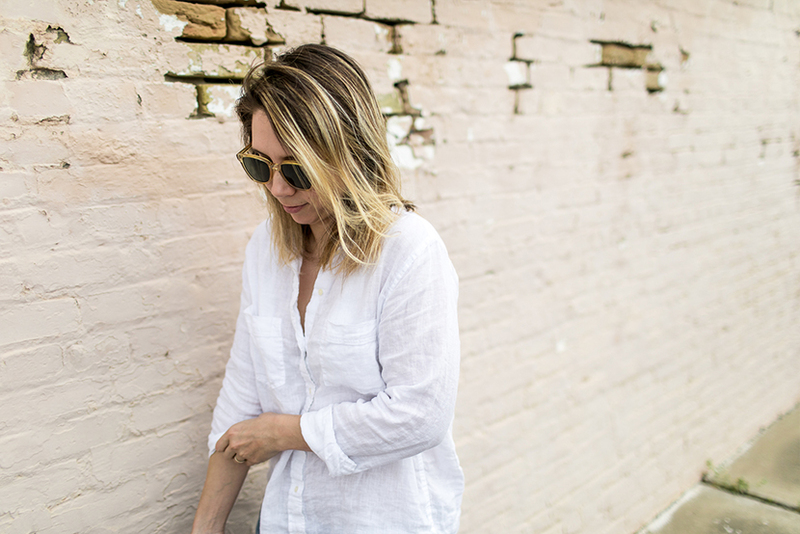 I am a solid believer in the linen button-up for everyday wear. Toss it in the dryer and let it get wrinkled. Sit in a car or at a café and let the creases happen. To me, the wrinkles and lines are a sign of living, being, existing, and being human. Those are all signs of beauty for me. So I live in my linen button-ups from spring to mid-fall. They are the life of my closet during these seasons. The lightweight cotton fabric is the thing dreams are made of, am I right?! 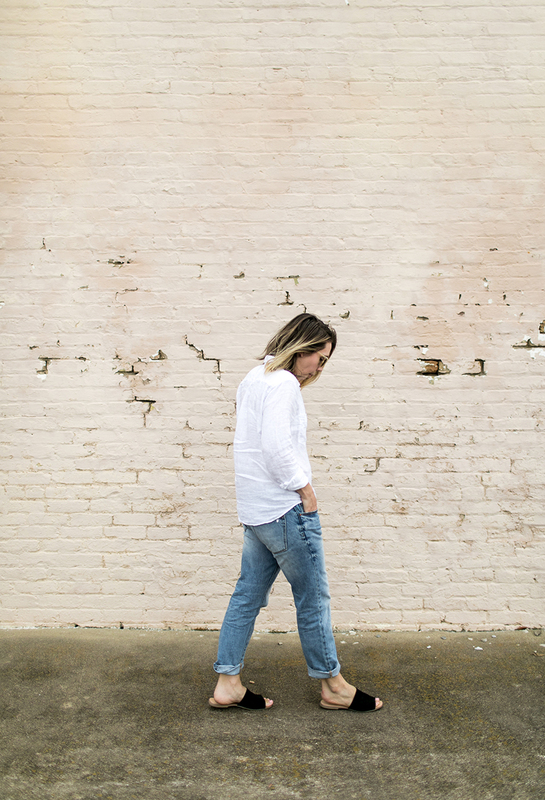 So, it should be no surprise that my on repeat outfit for spring is a white linen button-up, boyfriend jeans, and sandals. The look is minimal, easy to toss on, and works for most anything the day has ahead of you. 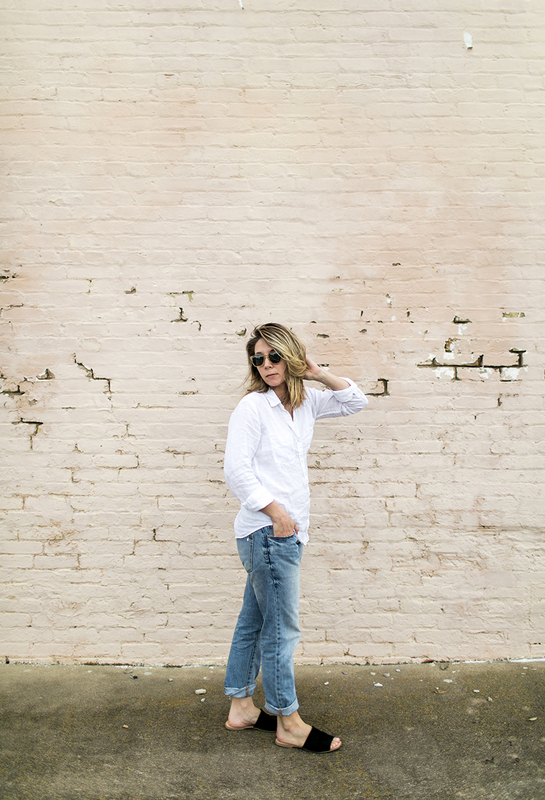 I already live in my boy jeans most of the year, but a linen button down is the perfect compliment. 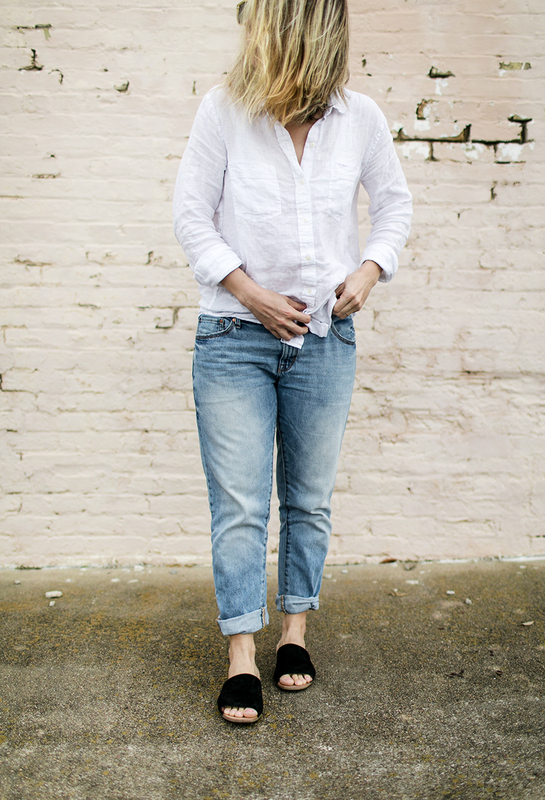 I am wearing a linen shirt from Gap, but I just added this Mollusk one to my closet that is made in California, that will be replacing the one pictured in my closet. My boy jeans are also Gap and though they no longer carry these exact ones, I am a huge fan of Gap’s denim. I have tried TONS of denim and the only pairs I buy now are from Gap and AYR. That’s it. If you have another recommend let me know, but these tend to fit my short and athletic legs. Finally, every year I buy a pair of sandals I plan to wear all summer and spring and I am completely in love with this slip-on from ASOS. They are very soft and comfy and easy to wear. These items are all part of the Spring Wardrobe Essentials post and worksheet I shared last month. 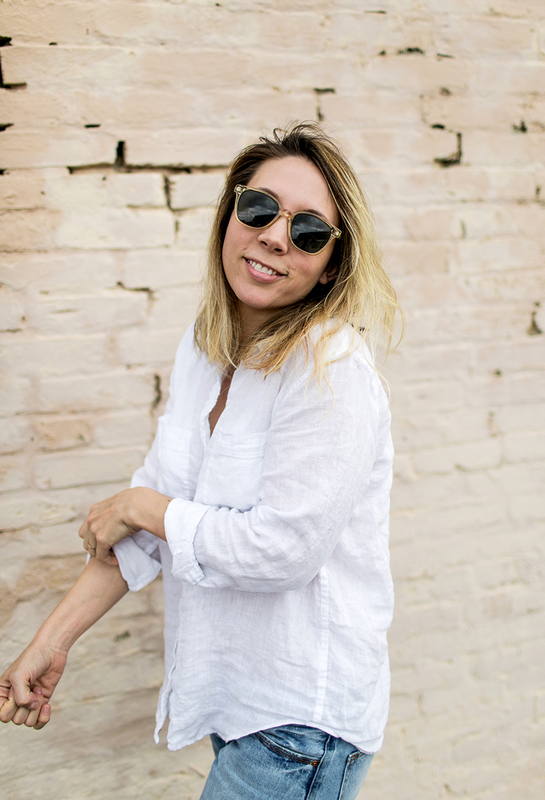 As I have said, each style post will now be using these essentials solely so you can see how to make the most out of these pieces, even if I completely believe these aren’t the only clothes you keep in your closet year around. The idea is these are the essential items that make the core of your closet. These should be the pieces you love the most. So tell me, what is your outfit you wear constantly this time of year? What are we most likely to see you in on spring days? 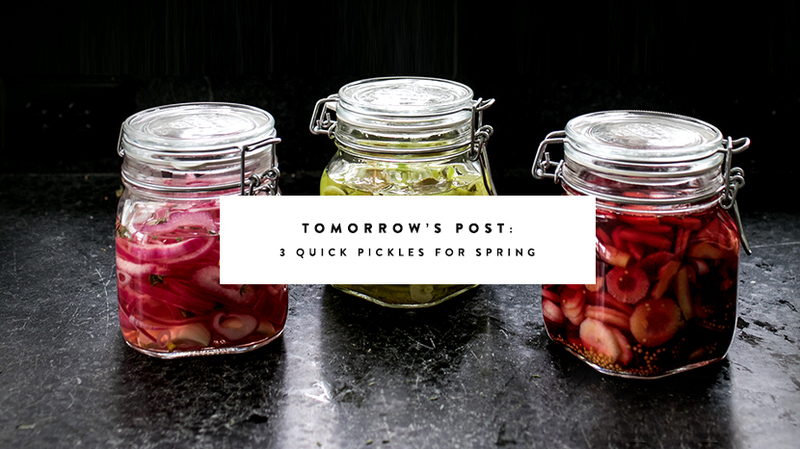 Tomorrow, we will be sharing 3 quick pickle recipes for spring! We have been using these on everything, so you won’t want to miss them because they are so easy. I just bought those Gap jeans as I was on the hunt for a good light wash / boyfriend fit for spring. Love this look! I would not put a linen shirt in the dryer for fear it would come out size 6 years old. (This happened to my husband’s beloved linen pants, which SIL thoughtfully put in the dryer when we were staying with her; they were far, far too small for him to wear afterward). However, I am of the line-drying-is-better-for-the-environment-and-smells-great-too school, so dryers rarely encounter my laundry. I have been on a linen obsession for something else: antique sheets. They feel SO GOOD (and smell so good when dried outside on the line). But I have had a hard time finding antique linen pillowcases. So crazy me: I bought a bunch of antique sheets and have been cutting them up into pillow cases. HEAVEN. And the material is nearly indestructible. They are made to be boiled and bleached and starched and sent through a mangle and still last for 100 years. 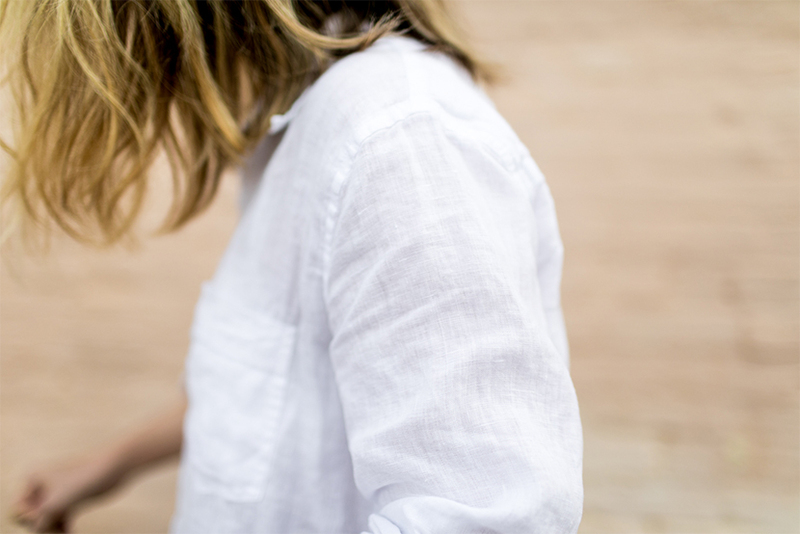 Linen season is the best season. and it saved my life on my trip to india. 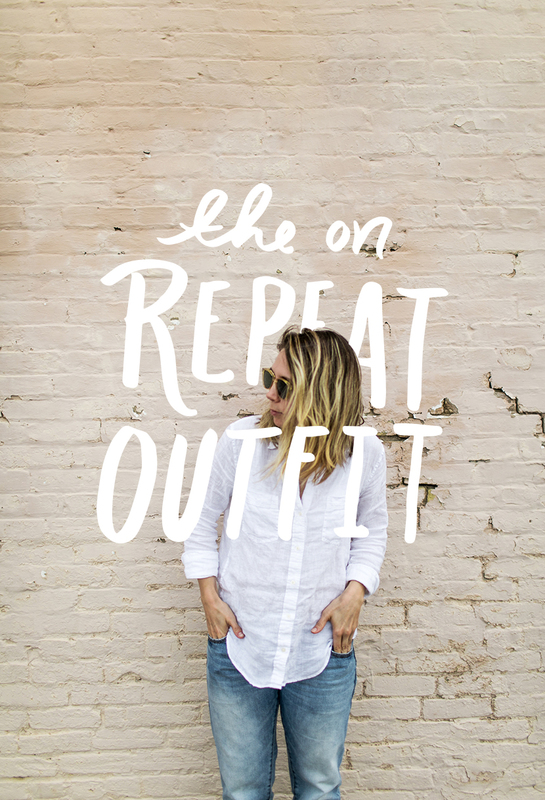 no better outfit to have on repeat. Yay for this post! I recently told my mother that I wanted to register for linen bedding and her reaction was a hell no. She doesn’t understand wanting a low key, lived-in look. Sigh. You’ve got me wanting a linen shirt. Reccomendations on where to get one for guys? As for my normal spring outfit, i tend to opt for a wider fit denim/trouser so i feel a little more comfortable and then a LONG SLEEVE t-shirt and lightweight jacket. I just loved this look! Here in brazil spring is a very hot season… this look looks more like autumn for me – and this is awesome because here we are in autumn right now. For spring, i like to wear light dresses and this kind of things. Oh so glad you found me! My sister in law is from Brazil! She does the same to learn English better! Such a smart thing to do. So glad to have you as a reader! I hope to make it to Brazil one day.